Traditional Irish stew begins with mutton (or lamb). It includes onions and other root vegetables such as turnips, carrots and potatoes. The use of Guinness beer in Irish beef stew is as Irish as the St. Patrick’s Day Leprechaun. In America beef was cheaper than lamb, therefore, the beer was an Irish-American addition used to give the less flavorful beef stew more flavor. Traditionalists would rather use cheaper shanks and other boney pieces with little to no meat on them to flavor the broth rather than switch to beef. 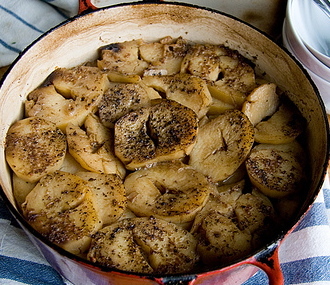 To thicken the stew they used potatoes, flour or barley grains. In this version of Irish beef stew the potatoes are sliced then layered. During cooking the potato slices near the bottom of the casserole dish break down then meld with the juices to thicken the stew. The black pepper really compliments this stew but the 2 teaspoons might be too much for children and those averse to pepper. Reduce the pepper to 1/2 to 1 teaspoon. Combine the flour and black pepper in a resealable bag or plastic container. Add stew meat, seal and shake until meat is thoroughly coated with flour. Heat oil in a large skillet over medium-high heat. Add half the meat. Brown on all sides then transfer to a large over safe pot. Brown the other half of the meat and transfer to pot. In the same skillet saute the onions for 2 minutes, adding a little oil if necessary. Transfer the onions to the casserole. Add the carrots, beef stock, sea salt and bay leaves to the pot stirring to scrape up all the burnt bits on the bottom of the pan. Pour into pot. Toss the potato slices on top of the onions and carrots. Season with a generous amount of black pepper and cover. Cook for 1 1/2 hours. To serve pour into individual bowls and sprinkle with a little parsley.